The phenomenon of “vaping” (using an E-cigarette, which resembles smoking) and availability of E-cigarettes and liquid nicotine has dramatically increased over the past several years across the country. Touted as a safe alternative to smoking cigarettes, E-cigarettes contain high concentrations of liquid nicotine which can poison a child with a single mouthful. The Washington Poison Center (WAPC) has seen a staggering increase in total calls to the poison center by over 600% compared to previous years. 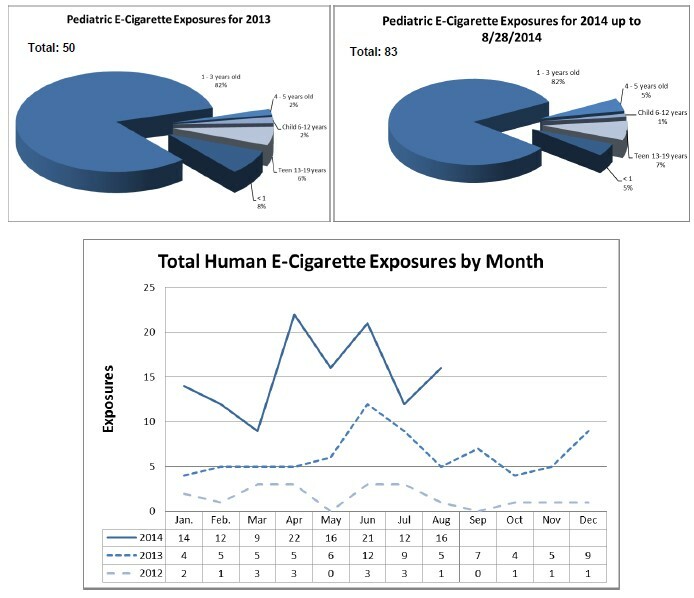 The graphs below compare current YTD exposure totals with 2013 totals reported to the WAPC for pediatrics as well as total human exposure data compared to previous years.